A pendant, that can be worn on a chain as a necklace, and also as a pin, has been beautifully designed by Soroptimist Villy Makou from Greece, previous winner of the CSW61 handbook cover competition in 2017. 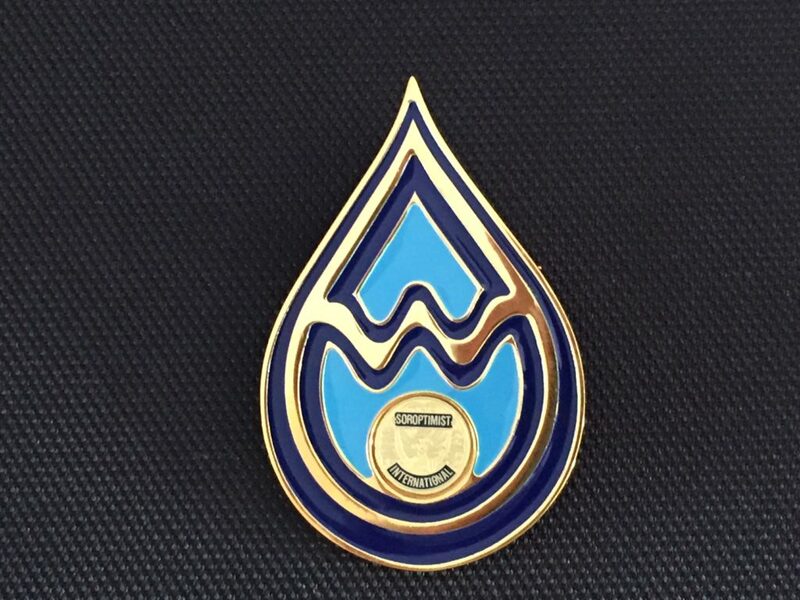 Created in silver and blue enamel, and in 22k gold plated and blue enamel, the stunning designs are now ready for sale – raising valuable funds for the projects, and the women and girls of the 2017-2019 President’s Appeal, Women, Water & Leadership. 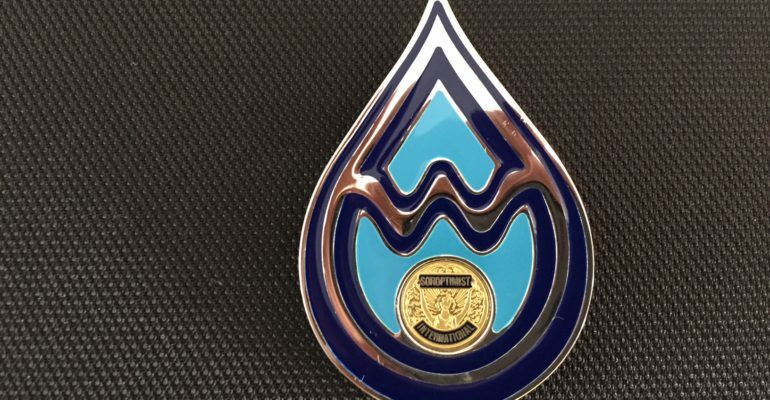 Image: Women Water and Leadership celebratory pendant in Gold and Blue. The Appeal is currently supporting exciting projects in Kenya and Bulgaria, and will in the future support at least three further transformative projects. Villy Makou says: ‘’The main source of inspiration for the creation of the pendant came from the title of the SI President Mariet Verhoef-Cohen’s Appeal 2017-2019. Two of the words included in the title, Women and Water, begin with the letter W. Thus, I designed two Ws made of water’s waving movement and placed them inside a drop of water, and when combined they form one W.
Their arrangement makes them interconnected and as two partners, symbolise: the role of Women and girls as equal partners at all levels of the Water sector to secure water for all. 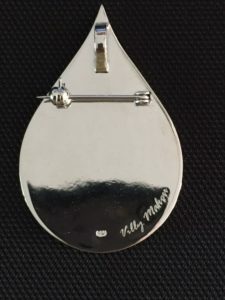 Image: Women Water and Leadership celebratory necklace/pin signed by Villy Makou on reverse. The pendant is made in silver and can be bought as platinum plated or gold plated. The price is 80 GPB, 90 EUR or 110 USD plus shipping and handling 10 EUR for one or up to 50 within Europe and 30 USD to North America. Villy Makou studied Fine Arts, Painting at Ecole Supérieure des Beaux Arts in Bourges, France and continued her studies at the Athens Superior School of Fine Arts where she also completed a Master in Theory and History of Art. During the period of 1987 to 1992 she lived and worked in Paris. Pierre Gaudibert, founder of ARC and director of the Musée d’Art Moderne de la Ville de Paris wrote the preface for her first personal exhibition in Paris at the Galerie Lavignes-Bastille (1991). She has presented her work in numerous personal and collective exhibitions while some of her paintings are held in private collections and museums in France, Greece, Cyprus and further afield. Since 1998, she has been actively involved in Soroptimist International, as a member of SIE Club Kifisia-Ekali, Athens of the Greek Union, where she has served in various leadership roles ranging from Coordinator of Education to Club President. As a Soroptimist she has organized many art workshops for disadvantaged children encouraging them to develop their self confidence and leadership skills through art education (SOS Children’s Village, Athens, Greece) Today, she lives and works between Athens and Paris. phone number etc. I look forward to hearing from you very soon. Thank you Penney M. Leezy, President Elect 2018-2019 Soroptimist International of Truckee Meadows.